It's been awhile since I've written anything, mostly because I've been busy actually making stuff, but I figured I'd take some time out to do some writing instead. 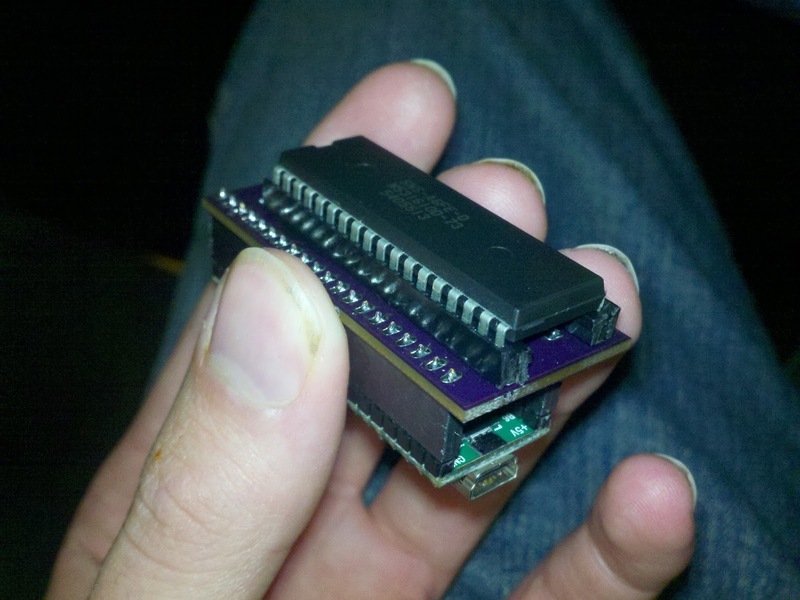 Something I've been working with lately is building SNES reproduction carts. I see a lot of people buying and using Willem-based programmers to burn their EEPROMs, and from what I can tell, they're way more trouble than they're worth, and more expensive too. I chose to go a different route and build my own programmer. 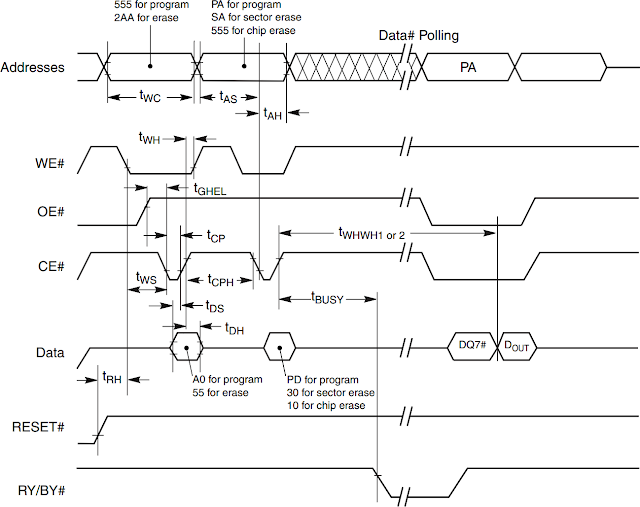 EEPROM programming is a pretty straightforward microcontroller exercise. 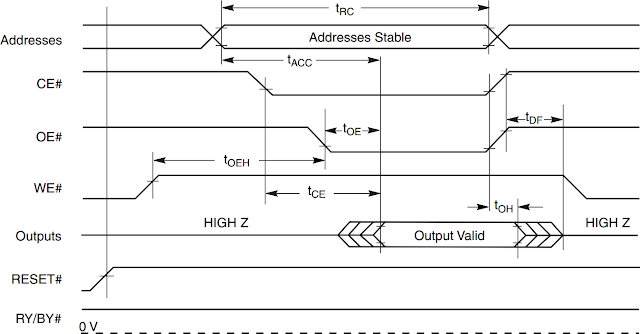 The main trouble is finding a microcontroller with enough I/O pins. 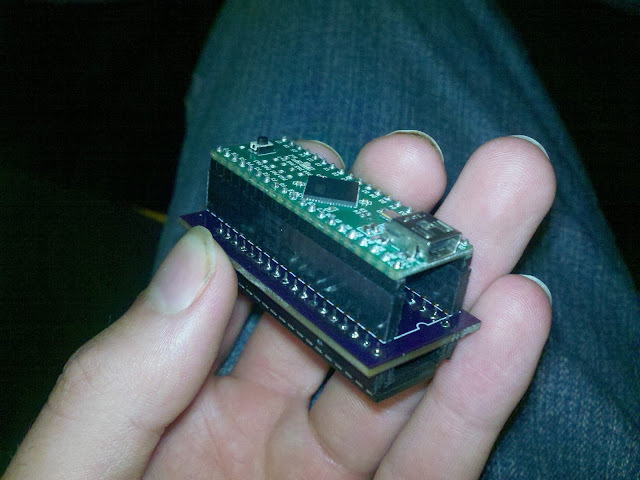 Personally, I used a Teensy++ 2.0 development board. One of the most common chips used for SNES reproduction is the AM29F032B, used with a TSOP-to-DIP36 breakout board, usually the one made and sold by BuyICNow.com. 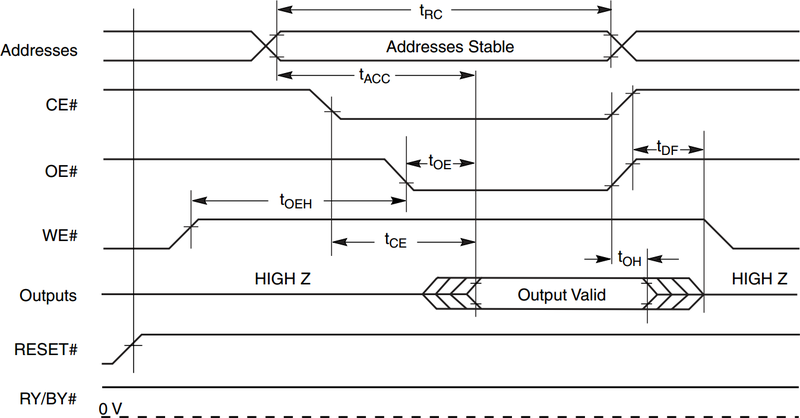 So, for lack of anything better to do, I'm going to explain how to go about creating a programmer for the AM29F032B, though much of the information can be adapted to any EEPROM. Ok, so now that we have everything wired up (or, in my case, I created a socketed PCB), we can start writing code. The most basic functions are reading and writing a single byte. The function prototypes will look something like this. ...and so on. Writing is almost identical, though you wouldn't think it, looking at the waveform in the datasheet. 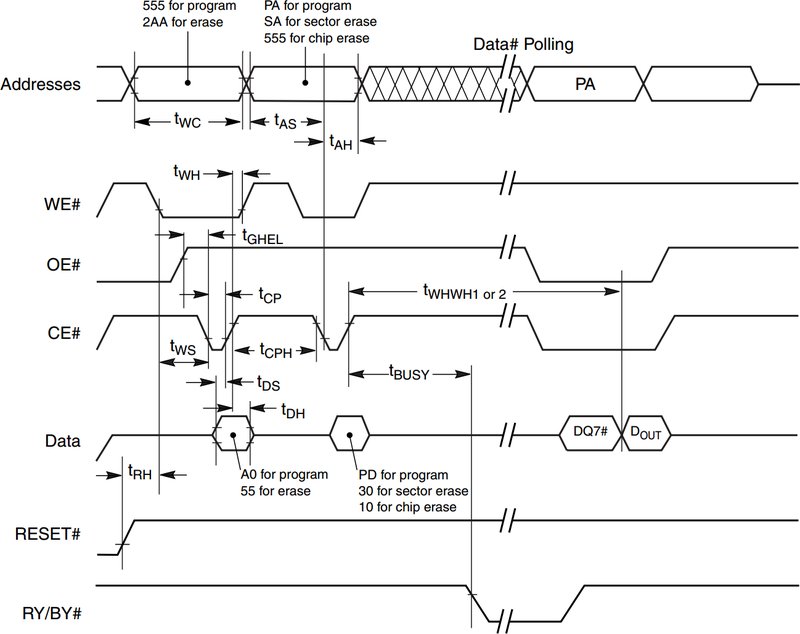 The write operation actually occurs when CE# or WE# is pulled high, which latches the data lines and then performs the write. No code this time, it should be trivial. Copy and paste the read function and make the necessary changes. where the final "addr" and "data" are the actual address and data that you want to program on the chip. All you have to do is call your WriteByte 4 times in a row with those addresses and data values. One last thing is that we need to know when the erase function has completed. There are several ways to do so, as described in the data sheet. The lazy way to do it is to continuously read any address (I usually pick 0x000) until the data returned is 0xFF. The reason for this is that during an erase procedure, the result of any read, instead of being the data at that address, is actually a status register. The status register will never equal 0xFF, but once the chip is erased, the whole chip will be all 1's, so any read should return 0xFF. Like I said, it's the lazy way to do it. Now, you have to figure out how to actually transfer data between the PC and the microcontroller. I use RealTerm, because it has the ability to transmit binary files over a serial connection. I then set up my Teensy++ main loop with a simple serial interface that resembles a command-line application, with various commands and flags, then I use RealTerm's send function for programming, and its capture function for reading. Once I've programmed the ROM, I read it back to a file, and compare the file against the original ROM file to make sure that they match (be sure you've padded your ROM file or else trim the file you read back to match the original file size or you may get an incorrect mis-match). Because I'm using the Teensy++'s CDC virtual-serial-port-over-USB interface, it would be entirely possible to write a full PC-side host application tailor-made for this device, but there really isn't much point, seeing as all it would be doing is sending a file to a serial port, or capturing data from that serial port. Better to just use an existing application, if it fits our needs, and RealTerm does just that. RealTerm apparently does a really terrible job of packet utilization for USB-CDC virtual serial devices, an issue which I've submitted to their bug tracker, though it hasn't generated any response, so it's unlikely to be fixed. For that reason, I've switched to Tera Term, as it speeds up write speeds by a factor of about 20-30, which makes the difference between taking 45 minutes to burn a chip with RealTerm vs about 90 seconds with Tera Term. This doesn't change the fact that I'm still using the same code on the microcontroller side. Anyway, I'll probably throw up some more pictures at some point, but for the most part, I wanted to describe the process, rather than just handing out schematics and code. This is a relatively simple feat to accomplish, and from what I've seen of a lot of the SNES reproduction makers, I feel it should be something of a rite of passage. If you want to just go out and buy yourself a Willem, go ahead. But be warned that nobody really wants to help repro makers with their crappy Willems. Be a man, roll your own burner. Hi! I am using this guide to try to write an EEPROM that is a a tad bit different than the one you are using. It has fewer address pins, and less memory. I'm new to programming, so some of this went over my head. I compiled a program, but I'm not sure that I have to code exactly right, as there is no data coming in through the COM port. I couldn't find a way to contact you through this website, so hopefully you're still active and willing to answer some of my questions. Thanks. Hi i have the teensy i use for ps3 with norway.py, but with these code only paste and these burn am29f032 or need more lines code. Sorry for mi bad English.